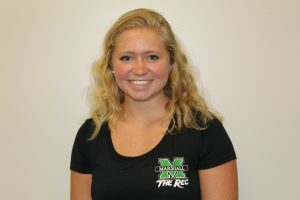 Learn more about the highly-qualified Personal Trainers at the Marshall University Recreation Center. Drew is a NCSF certified Personal Trainer, Second Lieutenant Medical Officer in the National Guard, and a graduate of Marshall with a degree in Hospital Administration. 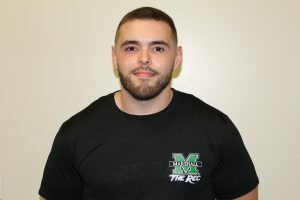 Drew ran track and cross country in high school, trained body weight conditioning while in ROTC at Marshall, exercised three years in Cross-Fit, and now competing in powerlifting for the past four years. He has focused on rehabilitation and strength building to build a confident and healthy person. Drew enjoys everything outdoors and learning as much as possible. Nikki enjoys getting to know what individually motivates her clients to start the challenging process of life-change and becoming healthy and whole. With hard work and commitment to what’s in front of us, she strives to give her clients the tools, knowledge, and encouragement they need to accomplish their goals – one day at a time. Her specialty areas are young athletes, those who are de-conditioned or new to fitness, and interval and circuit training. Nikki likes to work hard and to have fun. Outside the gym, she enjoys the outdoors, time with her husband and family, ultimate frisbee, hiking, running, playing the guitar, and enjoying time with friends. Nikki received her bachelor’s degree in American Sign Language Interpretation from Eastern Kentucky University where she also competed as a collegiate athlete in Track and Field – Triple Jump. She is a ACE Certified Personal and Group Fitness Instructor. Emily is an ACE certified Personal Trainer. She graduated from Virginia Tech with a Human Nutrition, Foods and Exercise degree with a concentration in dietetics. During her time there as an undergraduate, Emily was a Personal Trainer for two years and got the opportunity to work with a variety of clients. 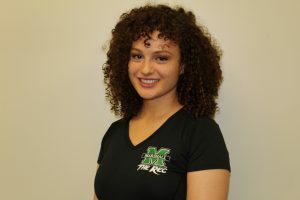 She is now at Marshall completing her Dietetic Internship and working towards her Master’s Degree. Emily’s personal fitness journey and love for the weight room has lead her to begin competing in bikini competitions and she is now nationally qualified. Outside of fitness, she enjoys anything involving food, adventure, and her puppy. As a trainer, she loves working with any type of fitness goals you may have. Her specialties include strength training, weight loss, muscle gain, and interval style training but is not limited to just these. 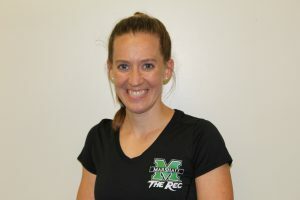 Jenna Clements is an ACE certified personal trainer, a West Virginia University graduate with a degree in Exercise Physiology, and is currently a student in the Physical Therapy Doctorate program here at Marshall University. She’s been training professionally for over a year since getting her first degree and is especially interested in corrective and functional exercise. She loves working with people of all ages, fitness levels, and backgrounds and exercises creativity in structuring individualized programs to meet the different goals and needs of her clients. Much of her experience is with working with deconditioned individuals and older adults in addition to challenging circuit style training with those looking to maximize the intensity of their workout experience. Cody is a certified personal trainer through International Sports Science Association. He is certified in Strength/Conditioning and weight loss. Cody has worked with a broad spectrum of clients, from Basketball athletes to amateur boxers and everyone in between. He can help any client achieve any goal as long as they are willing to work hard. Get to work with Cody! Wes is an ACE certified personal trainer and a certified cycling instructor. He is also a current student at Marshall University, studying Applied Kinesiology. Wes has an incredible passion for fitness and exercise, specializing in muscle strength and muscle gain. With this demeanor and passion he hopes to help his clients reach their fitness goals and help them become healthier and stronger individuals. Erika is a ISSA certified personal trainer. She graduated from Marshall University with a bachelors degree in Nutrition and Dietetics. More recently, she completed her dietetic internship at Keiser University, in Fort Lauderdale, Florida where she also earned her masters degree in Food and Nutrition. Erika’s love for fitness began in high school as she swam and played softball. Now, Erika feels most confident in the weight room, the yoga studio, and training through endurance cardiovascular exercises. In her free time, Erika enjoys hiking, mountain biking, racquetball and playing with her Lab Marco. Erika wants to utilize her nutrition knowledge and personal training experience to help you meet your goals in a holistic way. In addition, Erika focuses on lifestyle modifications, nutrition and exercise to overcome chronic disease and obesity with a naturopathic and functional approach. 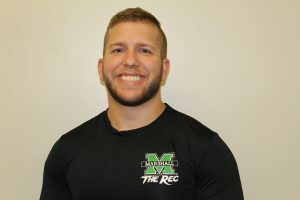 Tanner is a Personal Trainer and Fitness Instructor at the Marshall Rec Center. 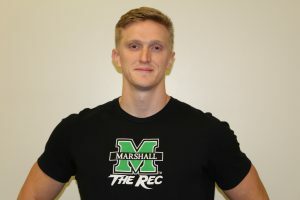 He holds a coaching certification through ASEP (American Sports Education Program) and is currently in his senior year studying health sciences at Marshall University. He wrestled in high school and had some experience with football and lacrosse. He has trained with some of the best collegiate wrestlers from around the area and continues to train individuals to improve their skills. He has experience when it comes to losing weight and improving his health. Tanner can help you reach your goals, whether it be improving your conditioning for competition, gaining strength, building muscle, losing weight or simply living a healthier lifestyle.